Brew your very own Ambrée-style beer, a Belgian beer style with sweet caramels and malts. This recipe lets you brew your own Ambrée-style beer, a Belgian beer style with sweet caramels and malts. The Brew Your Own Ambrée kit comes with full instructions. Designed and produced in France, you too can brew pro-quality beer at home. Sounds difficult? It couldn't be easier! Using professional-quality ingredients, you too can make your own beer in the comfort of your own kitchen. All-grain brewing is fun for anyone. 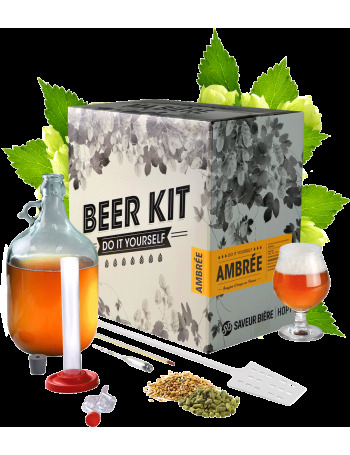 This beer kit contains all the brewing equipment and ingredients you need, all you need is a few everyday kitchen items - cooking pot, sieve, funnel - plus a little effort and a lot of patience. The brewing equipment is reusable, so you can experiment with new recipes whenever you like. Simply follow the instructions, and you'll soon be ready to enjoy 4 litres of pro-quality beer.